All sizes designed for european pallets 1200 x 800 / 1200 x 1000. Different sizes can be stacked into many configurations. 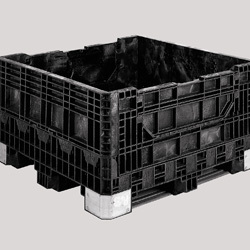 Superior container strength allowing average stacking loads 500kg. Reinforced base with stacking profile for superior stacking properties. Static control boxes available made from black conductive/antistatic plastic compound.